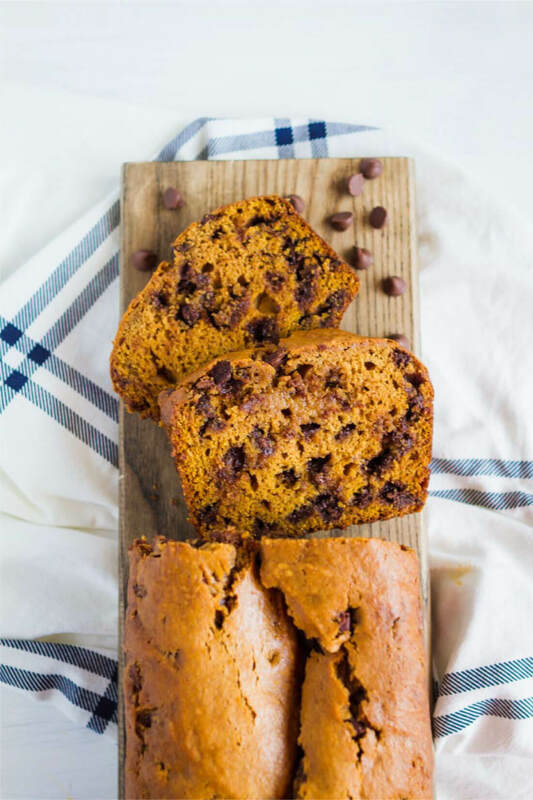 Nothing is better than this Chocolate Chip Pumpkin Bread when the weather cools and it’s time to bring in fall. It cooled down for about one minute in my area. Enough time to get me excited for fall. I put a long sleeve shirt with jeans and boots on. 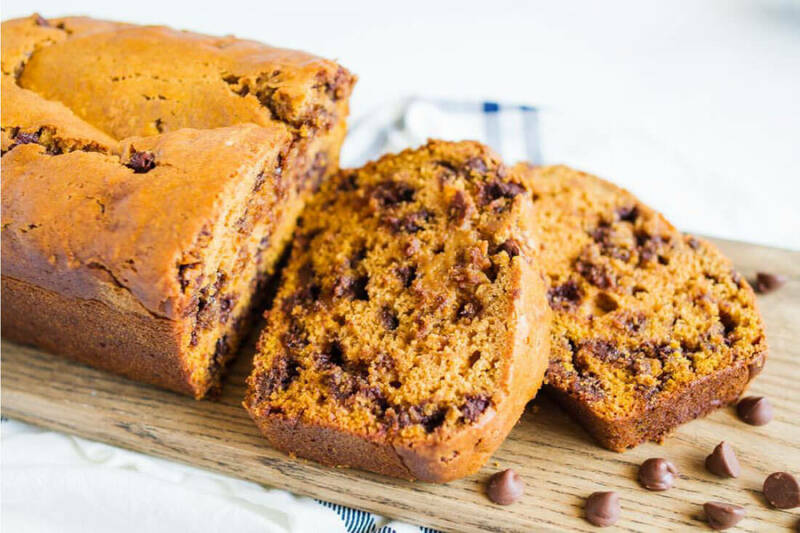 I baked delicious Chocolate Chip Pumpkin Bread. And then realized it had risen to 100 degrees outside and I put my flip flops back on. As much as I love summer, bring on fall! My kids got all excited that we were making this pumpkin bread. Jules even exclaimed “It’s that time of year already? YES! !” Apparently I’ve passed down the love of all things pumpkin from my mom. Grammy should be proud. My kids love quick breads. 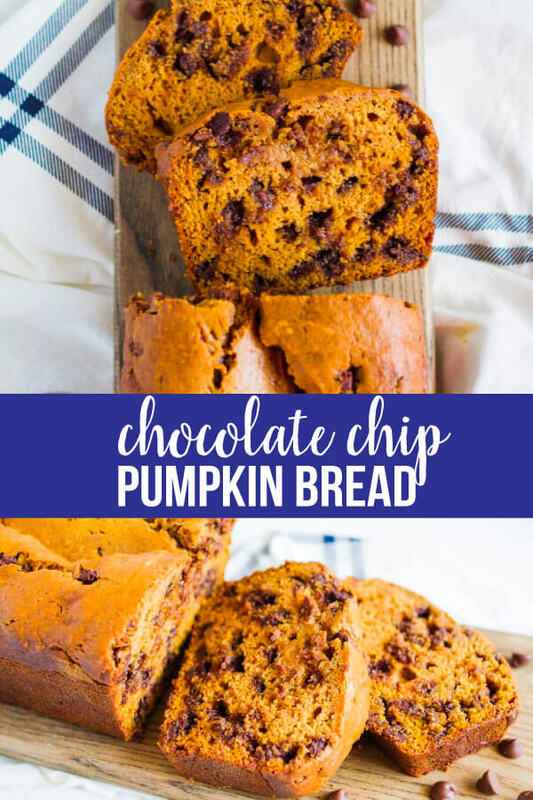 Add chocolate chips to any bread and they are in heaven. Same with Josh. He wasn’t a banana bread fan until I added chocolate chips and now he’s sold. They are easy to please. But this recipe is really good. 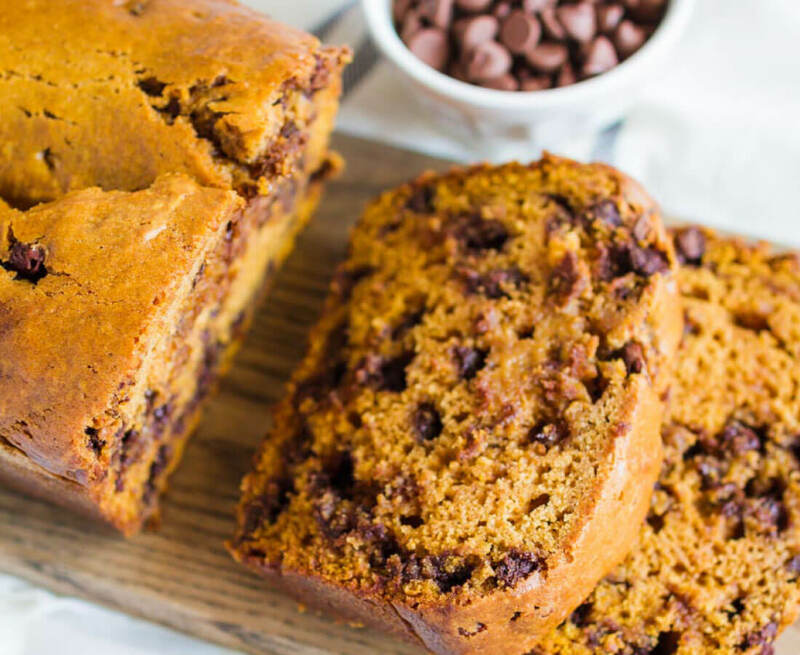 Here’s a quick bread pumpkin bread recipe that your whole family will love! 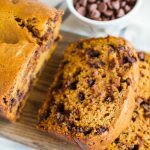 Nothing is better than this Chocolate Chip Pumpkin Bread when the weather cools and it's time to bring in fall - it’s easy and delicious! Grease 3 loaf pans and set aside. In a mixing bowl beat sugar and oil on medium speed. In a separate bowl mix dry ingredients - flour, soda, salt and cinnamon. Add dry mix and water alternately to the sugar mix beating on low speed. Cool in pans for 10 mins. Remove from pans and completely cool. Let it cool out of the oven and then slice it up and serve. It’s amazing as is but add a little pad of butter and it’s absolute heaven! This sounds delicious!!!! I can’t wait to try it!! Quick Q – can this recipe be halved? I’m sure it’s absolutely to die for, but I don’t really think we need 3 loaves! I also don’t have 3 cups of sugar on hand, so I was hoping the recipe could be scaled back. Thanks so much! oh my gosh amazing! this is my favorite kind of bread! I will have to try this recipe!! I AM proud!!!! I love me some pumpkin!!! Thank you. This bread sounds delicious. I am hosting ‘Treat Week’ at work in a couple of weeks and this will be perfect.